As I have mentioned previously (here, here, here, and here), the earth has a wide array of negative feedback mechanisms that help it cope with change. This, of course, is exactly what you would expect for a system that was designed by an incredibly intelligent Designer. Unfortunately, many people who study the earth don’t understand these negative feedback mechanisms or don’t appreciate how incredibly powerful they are. As a result, they overstate the severity of certain trends that scientists observe. One excellent example of this comes from the observation that in recent years, the amount of sea ice in the Arctic has dropped significantly. In the graph above, a 21-year average of Arctic sea ice extent is shown with the heavy gray line. The gray band that extends above and below that line shows the variation one would expect from random fluctuations. Now look at the green dashed line. That’s what was measured in 2007. Clearly it is far, far below the average, and it is well below what you would expect from random fluctuations. As a result, the drop in sea ice is probably the result of a systematic change that is occurring in the Arctic. Not surprisingly, some doomsayers went off the deep end when they saw such data. Obviously, it looks like the doomsayers were wrong. While 2007 was an incredibly dramatic year of low sea ice in the Arctic, the trend hasn’t continued. 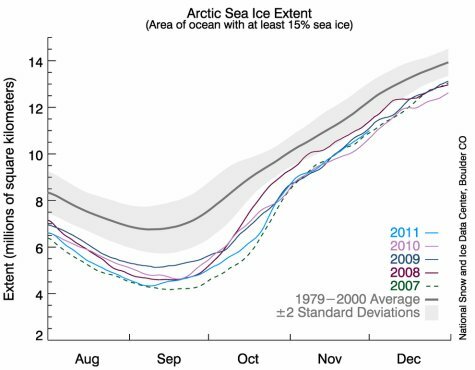 Instead, 2008 saw a marked recovery of sea ice, and while 2011 has less ice than 2008, it still isn’t as low as 2007. Why did the loss of sea ice seem to halt after its precipitous drop in 2007? Why weren’t the doomsayers correct in their prediction of a rapid drop in sea ice that would eventually lead to no summer sea ice in the Arctic in the very near future? Most likely, because of one of the many negative feedback mechanisms with which the earth has been designed. In fact, J.‐É. Tremblay and colleagues might have even uncovered which negative feedback mechanism is at play here. They surveyed the Arctic in 2007 and 2008, and they found that as the sea ice retreated, many organisms in the Arctic such as ice algae, phytoplankton, and zooplankton started increasing the amount of photosynthesis they were doing.1 After all, as the ice went away, more ocean was exposed to sunlight. In addition, the climatic changes that caused the loss of sea ice also caused changes in the local ocean currents. These changes brought in nutrients that the Arctic organisms needed to increase their photosynthesis. Of course, photosynthesis takes carbon dioxide out of the atmosphere and replaces it with oxygen. Thus, if atmospheric carbon dioxide really is driving an increase in the temperature of the Arctic, the increased photosynthesis caused by the retreating sea ice and the changes in the ocean currents ended up reducing carbon dioxide levels. If this is really what happened, it is a classic example of a negative feedback mechanism, and once again, it demonstrates how well-designed the earth really is. Now I personally don’t think that carbon dioxide is driving the loss of sea ice, but I am still willing to believe that the change in photosynthesis rates could reduce the melting of the sea ice in some other way. If nothing else, the energy of sunlight that is absorbed by the photosynthesizers can’t be used to increase the temperature of the surroundings. Instead, it is used to make glucose. Thus, increased photosynthesis itself could result in a reduction of local temperature. The main point here is not how increased photosynthesis might reduce sea ice loss or even if increased photosynthesis reduces sea ice loss. The point is that when the Arctic loses sea ice, lots of other changes occur. Tremblay and colleagues have found one process that has changed. There are probably lots of others. Since we know the earth is incredibly well designed, it is reasonable to conclude that at least some of those changes are part of earth’s elaborate negative feedback mechanisms which make the earth a very, very robust environment. If we honestly look at the scientific data we have, it is clear that the earth has been designed with a lot of forethought. As a result, rather than flying off the handle as soon as we see the earth undergoing a systematic change, we should think about the negative feedback mechanisms that exist in any well designed system. If we do that, we will lose the hysteria and will be able to concentrate on serious scientific analysis. This is an odd sort of question, but it is relevant. To what extent does photosynthesis reduce global temperatures directly by absorbing solar energy and converting it into chemical energy? That’s definitely not an odd question, Josiah. It’s a great one. Unfortunately, I have no idea. I have never seen any studies. It has to have some effect, but I don’t know whether or not it is significant. I think that’s a great question, with implications for creationist geologists who support the floating forest theory of coal origin. Some things to consider: The wavelengths used in photosynthesis (the ‘action spectra’) peak in the red and blue regions of visible light. ‘Heat’, as we sense it, is in the infrared. Even the visible light that is reflected off of plant surfaces is reflected at longer wavelengths (look at infrared photos of plants – they glow red, meaning they are radiating heat). Leaf temperature can in fact be much higher than the surrounding air but is controlled by the evaporative cooling of transpiration. So while some of the energy from sunlight is used for photosynthesis and ultimately stored in the chemical bonds of glucose, my guess is that it is a very small part of the total energy contained in the total spectrum that can ultimately contribute to heat in the environment. Also, don’t forget that some of the concerns about arctic melting have to do with the albedo effect: white surfaces (snow, ice) reflect radiation while dark surfaces (vegetation, soil) absorb it creating locally and regionally higher temperatures. Greg, you are certainly correct that photosynthesis uses mostly blue and red wavelengths. However, you aren’t correct on the infrared issue. Leaves (and anything else that is warmer than the surroundings) emit infrared light because they have absorbed energy to become warm, and they are now releasing that energy as dictated by the Second Law of Thermodynamics. Thus, its not that infrared light is the light from the sun that produces heat. The emission of infrared light is simply one of the major means by which warm things cool down. Because photosynthesis occurs, leaves are cooler than they would be if photosynthesis did not occur, because the energy of the wavelengths absorbed is not used to heat the leaves. It is used to make glucose. Thus, photosynthesis does cool the surroundings. Of course, the real question is, “By how much?” Since only certain ranges of wavelengths are absorbed, only a certain fraction of the energy is diverted into chemical energy. I am not sure how much it is. It might not even be significant enough to consider, as you seem to believe. However, I don’t know of any study that says so one way or the other. As a result, scientifically, it is at least one avenue to consider. I do agree that the albedo effect is important as well. The albedo of salt water in the ocean is about 0.06, while the albedo of sea ice ranges from about 0.5 to about 0.7. Thus, the ice reflects a lot more light than the water. This would mean that melting ice would cause more light to be absorbed and less to be reflected, which would result in more warming – a positive feedback mechanism. However, we know there must be more to it than that, because if that were the main issue, the ice would have most likely continued its steep decline. Since the decline of has has halted for now, there must be something else at play. Digging around, I find references to photosynthetic efficiency being anywhere from 0.1% to 8% depending on the species with most plants less than 2%. So that’s the rough conversion rate of total energy received from the sun (in Watts or Joules per unit area) to energy stored. Greg, I don’t think that number alone gives us what we need. First, we are talking about phytoplankton, not plants, so we need a better idea of whether it is near 0.1% or 8%. However, let’s take the 2% just for argument’s sake. If I am understanding what you mean by “efficiency” correctly, that means for every photon absorbed, 2% of the energy goes into chemical energy, and we can assume that the rest eventually goes to heat. However, there are couple of other numbers we need. First, we need the difference in albedo between ice and phytoplankton-rich water. Since phytoplankton are typically green, they are at least reflecting green light. Thus, they have an albedo, and that helps get rid of some energy. We also need to know the total percentage of photons absorbed by the phytoplankton. If phytoplankton absorb, say, 25% of all the light that contributes to warming, then even a 2% efficiency will have a serious impact on temperature. If they only absorb a few percent of all the light that contributes to warming, then the effect is probably not significant. Of course, this would partly depend on the population of phytoplankton, so that would have to be known as well. I expect there are other things one has to worry over as well. I’ve just realized that my own question is itself largely irrelevant. While plants in general, and plankton in particular, will absorb some of the energy from the sun and transform it into chemical energy, once they die and biodegrade the energy will be released once again into the environment as that’s an exothermic process. Even if they’re eaten the energy will eventually escape as heat. Only if they are turned to fossil fuels will the energy be stored away for any sort of longer time scale. You are correct in a sense, Josiah. However, plankton tend to sink, so when they decompose, they are doing so deep in the water. That still goes into the total energy budget of the planet, but not into the atmosphere and land, which is what has a first-order effect on temperature. The Debate Rages On…At Many Levels Another Goldilocks Planet?